Thinning hair and baldness is so common that many individuals attribute hair loss to the natural aging process. Alopecia, which is the medical term for baldness, is experienced by over 50 percent of all adult men and women in the United States. 30 percent of all people suffer from some type of hair loss before they turn 30, and 50 percent experience worsened thinning hair and balding by the time they turn 50. Despite what many people think about thinning hair and hair loss, this condition is not entirely hereditary, and is not a natural part of the aging process. In reality, alopecia is often caused by factors that include hormonal imbalance, nutritional deficiencies, and the use of prescription and over-the-counter medications. 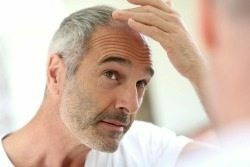 Regardless of whether you’re a man or woman experiencing problems with thinning hair and baldness, here are the top three ways to reverse these conditions and enjoy a fuller head of hair. Hormones drive normal and healthy bodily function, so if your hormones are off-balance, your body will experience a domino effect of various health problems. In this case, pregnancy, menopause, or an overactive or underactive thyroid can lead to hair loss and baldness. Hormonal imbalance can be corrected by exercising regularly, maintaining a healthy weight, eating a nutritious diet, or by undergoingbioidentical hormone replacement therapy (BHRT). If your diet lacks vitamins and nutrients, especially omega-3 fatty acids, your hair will suffer as a result — especially since omega-3 fatty acids play a major role in hair growth. Enrich your diet with plenty of fruits and vegetables, and eat more foods that contain omega-3 fatty acids such as salmon, sardines, mackerel, herring, flaxseeds, and walnuts. Over time, you’ll be able to see hair regrowth as long as you maintain a healthy diet. Although it may seem impossible to fully wipe stress from your life, find new ways to manage stress or work on eliminating certain sources of stress from your life for good. Stress interferes with our bodies’ hormonal imbalance, which is mainly why it contributes to hair loss. The healthiest way to manage stress is to exercise regularly and eat a healthy, balanced diet — both of which will naturally help rebalance hormones and release a series of neurotransmitters that battle stress.